Recent legislation from Texas to California focuses on banning payday lending. This ban inherently assumes that the 12 million people who take out ~$7.4 billion in payday loans every year are incapable of making intelligent decisions and must be protected by removing this choice. The correct answer is probably a bit of both, but 66% of a population making irrational decisions suggests to us a lack of understanding is a big driver. Our data supports this conclusion. The attached chart shows the higher ranked a lender is, the more visitors the lender gets from our site. The same is true with price – the lower the price, the more visitors. The only exception occurs between the top ranked lender classes. Here, users appear to be willing to pay more to use a state licensed lender rather than an unlicensed lender. This supports the conclusion that payday borrowers are not only capable of making rational decisions but of making fairly sophisticated trade-offs when provided tools and information. What is odd to us is why any borrower goes to lower ranked, higher cost lenders. One hypothesis is this occurs because in states where payday lending is banned, licensed lenders are not an option forcing borrowers to go to higher-priced, riskier lenders. We will examine this hypothesis in more depth in a future post. 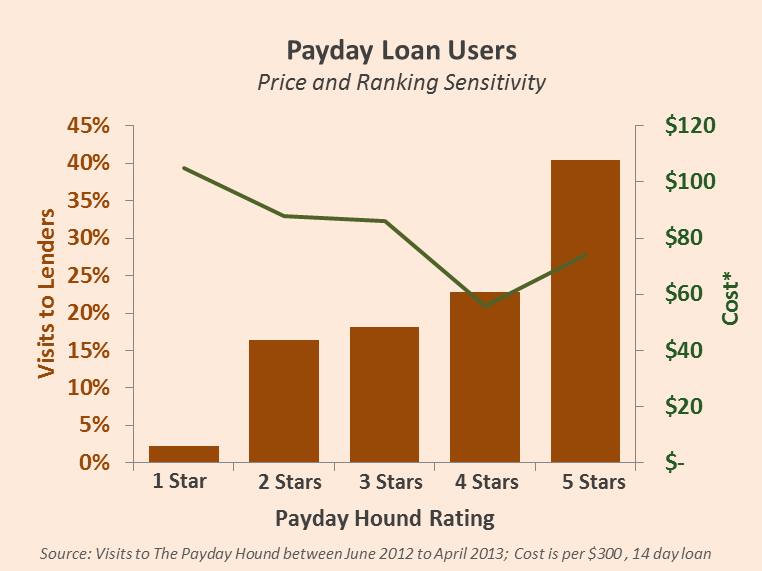 The Payday Hound’s preliminary results show payday borrowers do make rational decisions when provided with tools and information. This makes sense; after all, can one imagine trying to select a mortgage in an environment where there is no truth-in-lending regulation, anyone with capital can make mortgage loans, and there is no consequences for lying? We imagine if this was the case, 66% of prime borrowers would also make poor decisions. The Payday Hound suggests that legislators consider focusing more on creating consistent, cohesive, enforceable regulation in the short-term lending market, much like prime borrowers enjoy in the credit card and mortgage markets, rather than reducing choice by banning a product. Just like banning unregulated mortgages in the example above does not address the need for mortgages, banning payday loans does not solve the need for short-term credit. We believe regulation that focuses on creating a short-term, loan market that is fair, transparent, and competitive is more helpful to borrowers than reducing choice.